Not sure if this is a quirk with my 2015 Corvette Convertible, if I'm doing something wrong, or if there is something broken. There is absolutely NO difference in air temperature from the 4 upper heat vents if I have the temp set from 61 to 89 degrees (manual mode). For example, setting it at 61 feels like 75 and like 89. The only way I can get the car to blow very hot air is to have it set as "HI". So it's either very luke warm (61-89) or roasting hot (HI)......nothing in between. I've tried setting it on 89 degrees and AUTO mode, yet hardly any air comes out of the vents even on a cold night where it's 60 degrees out. I miss the days of basic climate control systems that were reliable. On my 16, I've never taken it out of auto. It works fine.Just change the temp and it works. Perhaps you should have it looked at. Hmmmm...that's interesting. Which vents does the heat below on Auto? My car was fully warmed up. It can blow hot air, but only on the HI setting. Thanks- sounds like something must be wrong. I only have 2 months of warranty left, so need to get it checked out soon. My 15 has a mind of its own. In FL I use air almost everyday and I have to turn the air to LO to get cold on some days and on other days it is cold at 72. Heat really doesn't work on auto. My AC/Heat has done this since day one. As long as I can get cold and hot air from the system, I will stay away from the dealer. I do have the extended warranty if either stops working. 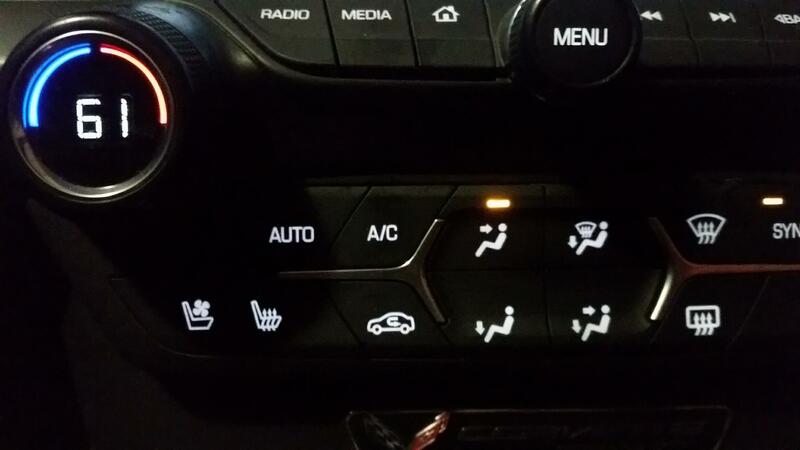 Interesting to read your 2015 climate control has been acting up as well. IMO this is the issue with auto climate control, which trys to regulate the inside cabin temp to the number on the dial. What you're after (and what I want) is to regulate the air temp coming out of the vents, which is something climate control doesn't do (regardless if you're in auto or not). Unless you have the thermostat set to an extreme (hi or low) you get what you get. BMW has it figured out and includes a little wheel that allows you to control the actual air temp and it works as a great compromise with an automatic system. This topic is a pet peeve of mine as I hate climate control. I want to control the air temps, not the cabin temps which I never find works (at least here in Las Vegas where the outside temps might be okay but the unfiltered desert sun beams into the car like a laser and cooks you faster than a microwave). I find most of the time I just want the air a little cooler or a little warmer etc. Which is something any old HVaC system from decades ago did perfectly fine. You need to be like Ron Popiel: Set it and forget it. In auto mode in cold weather with heat selected the system will run in a bi-level blend mode with hot air primarily coming out of the lower outlets and no or moderate temperature air coming out of the top. The temperature blend will be biased further towards heat from the lower outlets if the cabin light/sun sensor detects bright sunlight because it is assumed that will further heat the upper part of the driver and passenger. This is the way most systems have worked for years. If you manually put the system into upper only with heat it is still going to stick with its logic of not putting very hot air out of the upper vents and will take MUCH longer to heat the cabin up. As you have found the only way to override this is setting the temperature to maximum. We have reached the point where manufacturers have largely adopted the "we know better than you" and many systems are designed to enforce the designer's beliefs and preferences. Microsoft Win 10 is a classic example where user control has been drastically reduced from earlier versions. 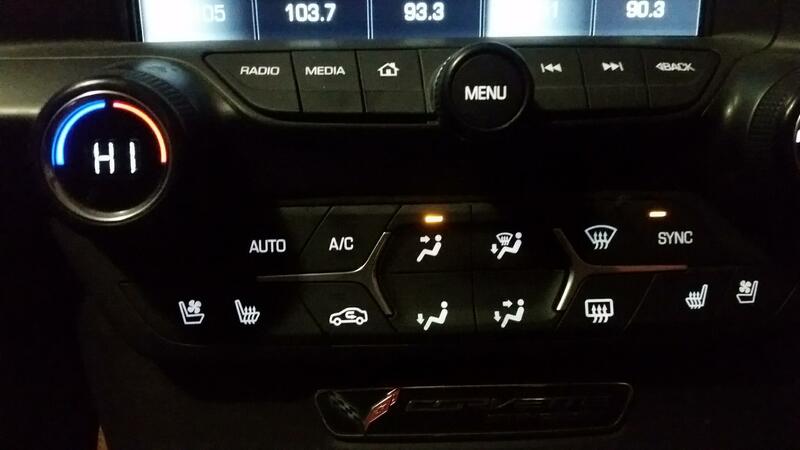 My 2014 Cadillac ATS heater works much like that in my 2016 Z06 and I have been happy with its auto mode performance but about a year ago when I had an older relative in the car I ran into the same issue you did with your Corvette in trying to convince the system to put out hot air from the upper vents. Putting the system in recirc mode (watch out for fogging) does reduce warm-up time. 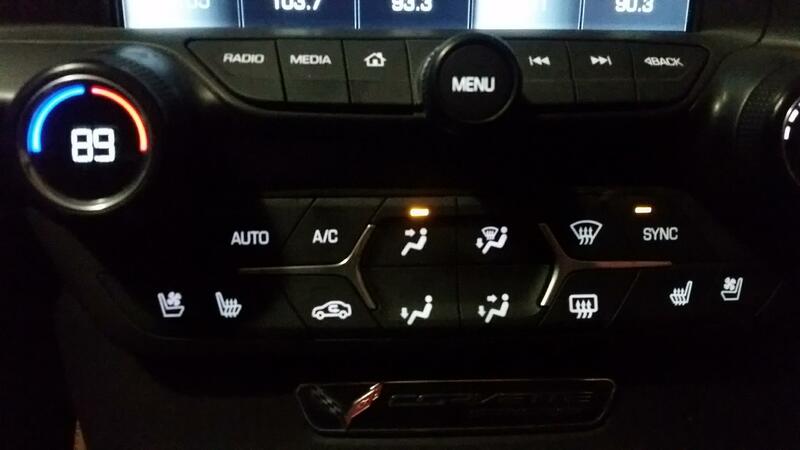 At least my Corvette has an A/C off button so you can easily run vent only without engaging the compressor when conditions are nice. 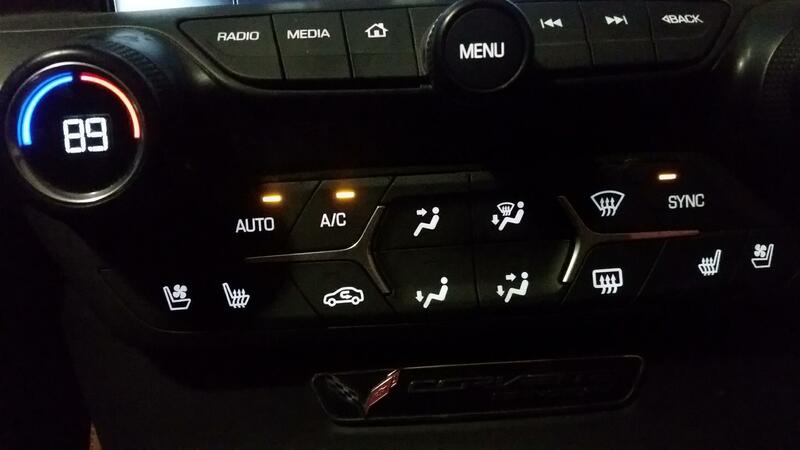 With the Cadillac I have to go into the CUE system additional climate controls to turn the compressor off. Last edited by NSC5; 03-31-2018 at 08:47 AM. There are some tsb’s out for problems like yours. I have a somewhat similar problem with mine and have been trying to get it fixed for over a year. Got it in front of head HVAC engineer for Corvette now and he’s talking like they might be able to figure out something. Make the dealer check for tsb’s. Dealer visit while you still have warranty. Yes. Just get it looked at and repaired under warranty. In old systems a fan that would run only in high would be a classic case of blower resistor failure, a very easy and cheap repair. (I had one of these repaired in 2005 for $58.88 including labor.) However, I've got no idea what's up with your car.